A native of Orange, Jeff attended New England Institute in Newton, Massachusetts and graduated from Dallas Institute of Funeral Service- Pierce Mortuary Jeff Colleges, Dallas, Texas. 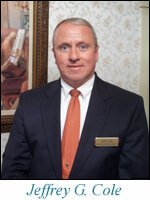 He started his internship at Witty's Funeral Home in 1995 and became a Licensed Funeral Director and Embalmer in Massachusetts in 1998. Jeff is active in the North Quabbin region and takes pride in providing funeral and cremation services, to families with care and concern. Call Jeff Cole and his staff at Witty's Funeral Home to help guide you with your wishes. Serving the communities of the North Quabbin region for over 100 years with respected services and value.